Create Simple, Stunning, and Modern Coming Soon and Maintenance Mode Landing Pages for your WordPress Site & also limit access to your Website while Under Construction. Make Sure your site launch is a success! Why Coming Soon Booster ? Coming Soon Page not only works as a placeholder to your website but also acts as an effective lead generation tool that supports your new online projects before launching the site. Do not waste time, let your visitors know that you are launching a website. Coming Soon Booster efficiently promote your brand and facilitates your marketing campaigns. You can show your business ideas to your visitors which will eventually makes your brand trust-able. 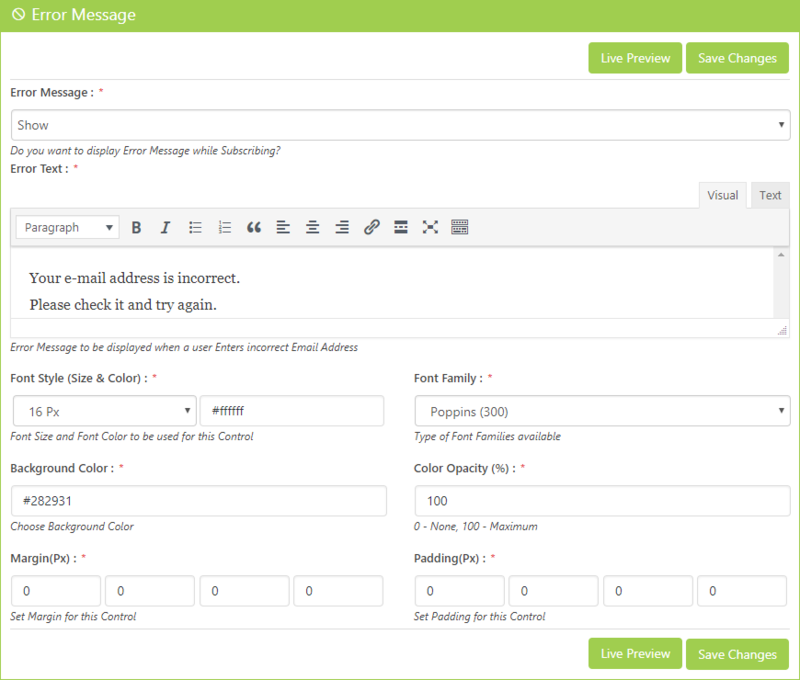 Coming Soon Booster collects emails via Email Subscription Form and helps you reach the target audience. It creates a strong ties with the Customers & the Visitors of your website. Coming Soon Page will influences a visitor's to reach a decision. It sets an easy option for users to take actions, and these actions leads the conversion rate. Coming Soon Booster is an amazing WordPress Plugin which is packed with advanced features, for a powerful and effective maintenance mode / launch page that stands out from the crowd. Background Settings , Loader Settings , Logo Settings, Button Settings and more. You can also see the live preview of your landing page on a single click and change it to different mode according to your choice. Coming Soon Booster gives you a fully responsive, attractive and professional coming soon pages with various customization options. 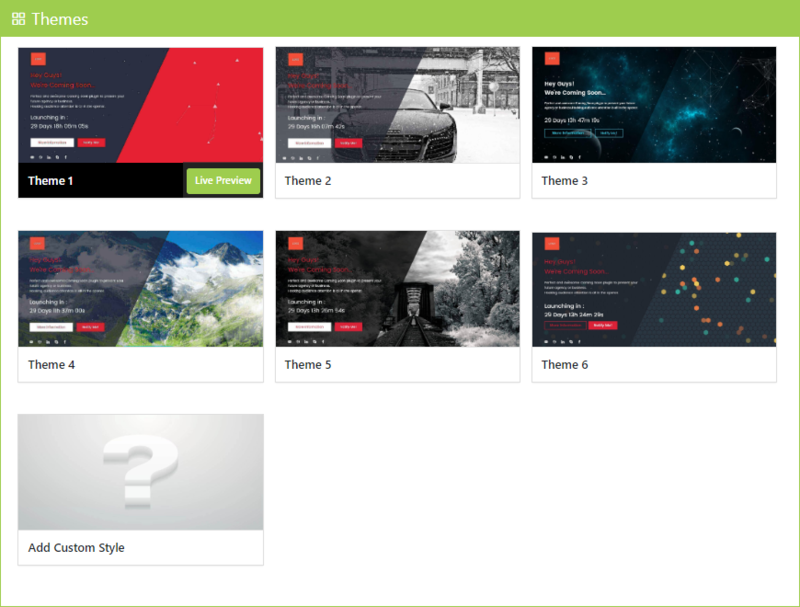 It offers you to create your own custom theme or customize all the available default themes. 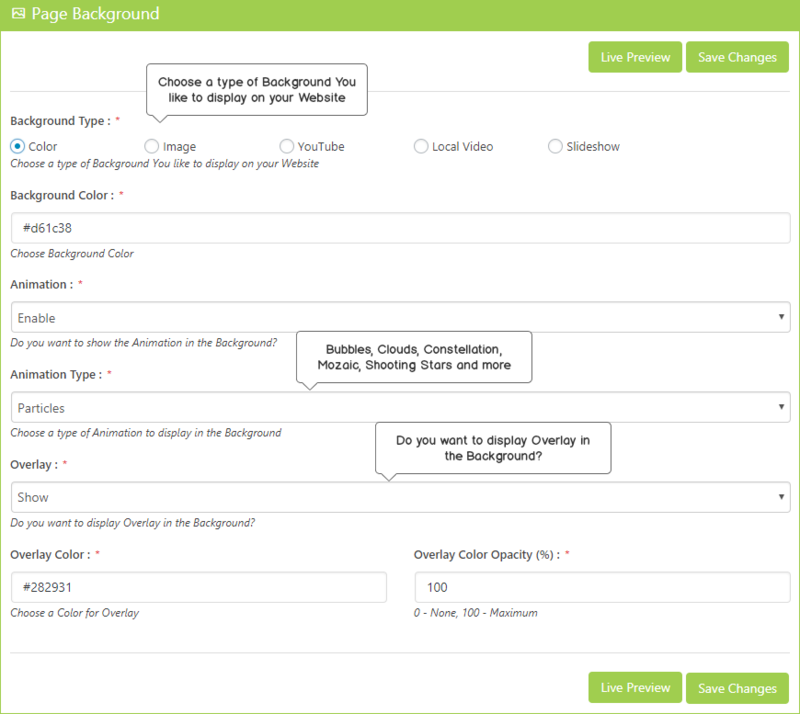 Coming Soon Booster allow you to configure Background settings, it could be an image, any video, a slideshow or any color of your choice. Coming Soon Booster also allows you to show / hide overlays with various style options. You can also add animation to your landing page through Coming Soon Booster. You can also provide position to your image with different animation to make your page more attractive and stunning. Coming Soon Booster allows you to configure any YouTube video with different playing controls. Coming Soon Booster allow you to configure logo settings, it could be text or an image. You can upload your own logo and can also upload Fav-Icon to be displayed in the address bar of the coming soon page. You can also provide link to your logo by providing logo link path. This feature is available in both logo type either its image or text. You need not to worry as your page is search engine optimized. 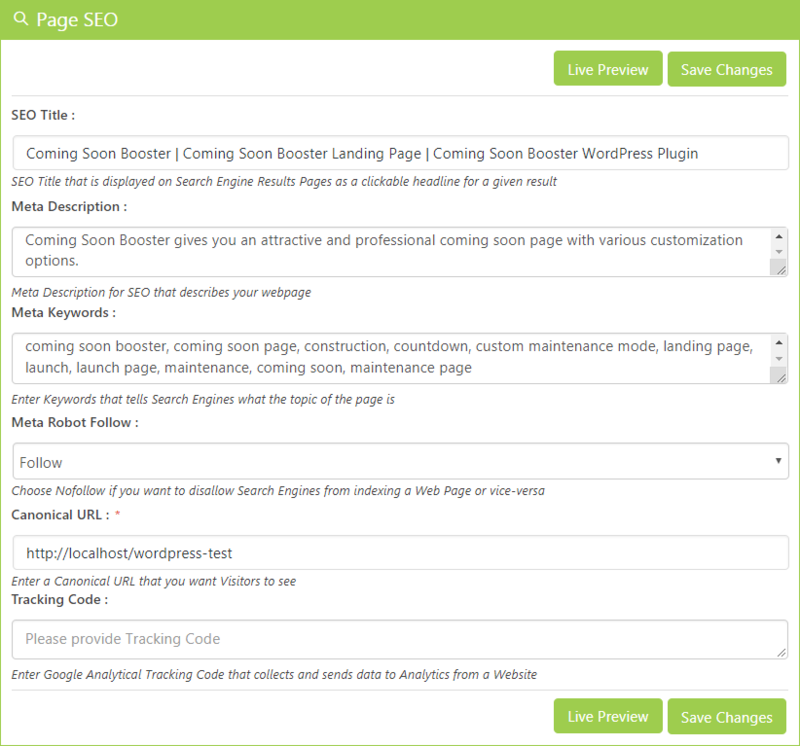 Our Coming Soon page template is SEO friendly as you can set SEO Title, Meta Description, Meta Keywords, Canonical URL, Tracking Code and also (follow / no follow) Meta Robots. Using Tracking Code, you can track each & every traffic activity on your site. Using Tracking Code, you can track each & every traffic activity on your site. The countdown timer counts down in seconds, minutes, hours and days to any date and informs your customers about the website release. 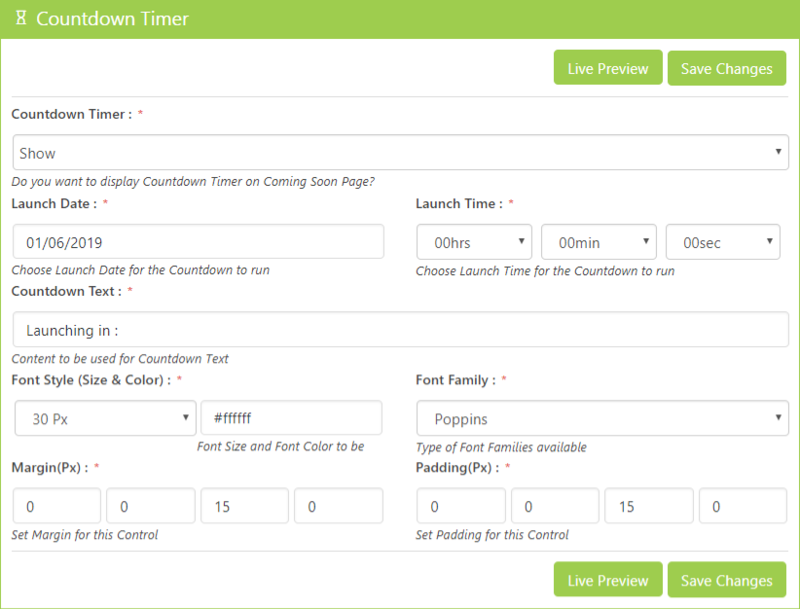 Easy to set up and allows you to set your own date for countdown timer. You can customize the text settings for countdown to display it in your own style and also set margin and padding controls for countdown timer. 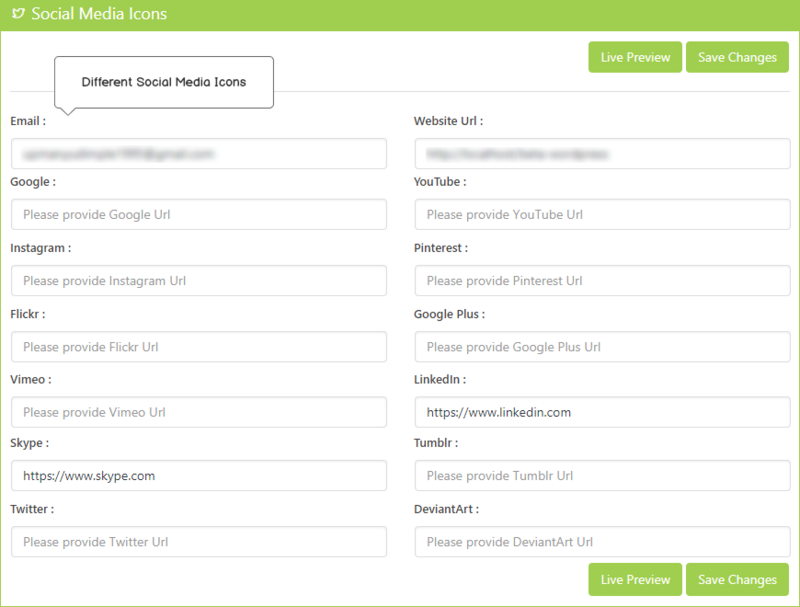 Social networking icons are added to the coming soon page, allowing you to increase your online presence and gain a following before your website even launches. Our Social Linking feature make it easy for visitors to share your website and for you to share your various social media profiles. 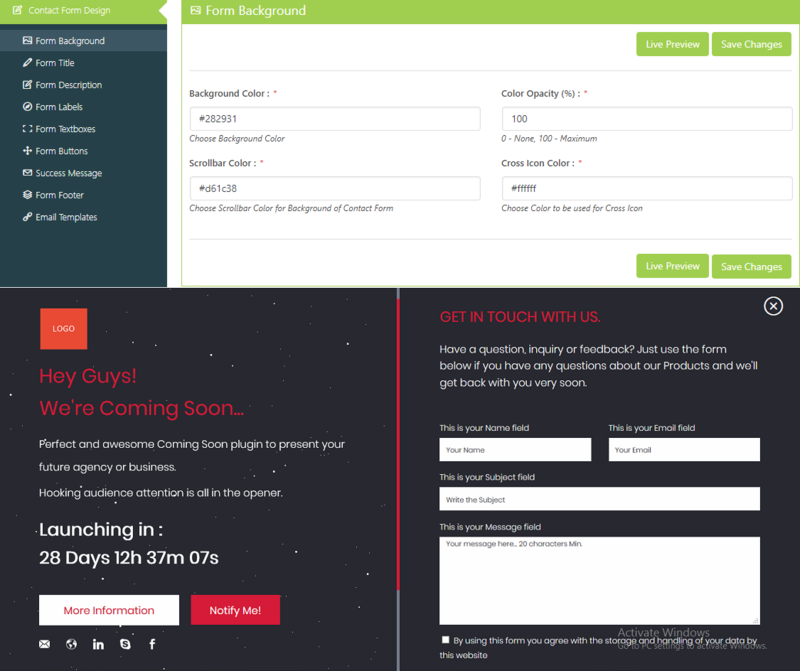 Coming Soon Booster allows you to configure settings for Contact & Email Subscription form. You can customize background, heading, text, button and messages for the forms. 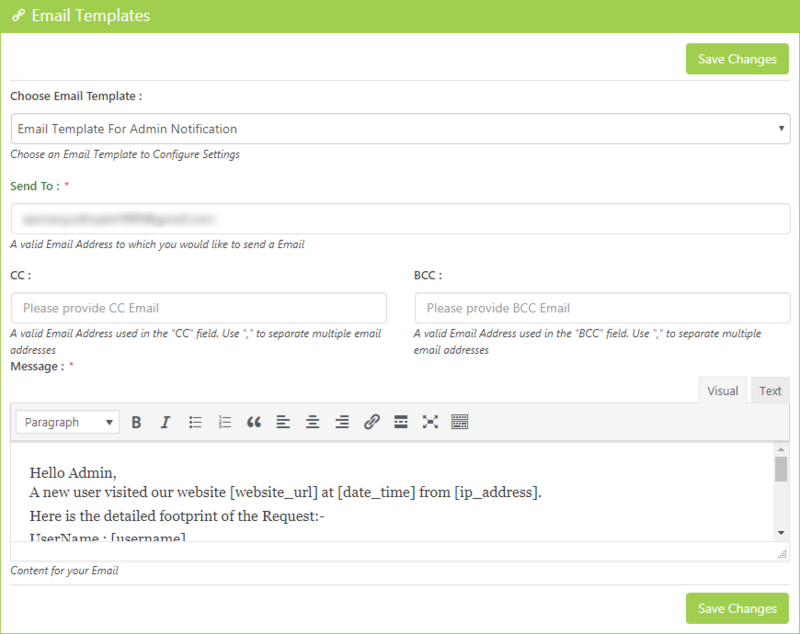 Email Templates allows you to configure, when email would be sent. It has two events first is when user contacts you through contact form and second when user subscribe themselves. Coming Soon Booster has option with back-end Contact & Subscription form data and you can also download or extract your Contact & Subscription form details. Even you may specify Date to view information regarding the users who contacts you. In Coming Soon Booster, you can view the details and data of what user has filled in the Contact / Subscription form. You can check, filter and can delete those details or records which have been saved in table. Coming Soon Booster allows you to define your own custom Error & Success message. Error messages will be displayed when the customer enters a wrong email address in subscription form. You can also provide background color, opacity, margin and padding to your messages. The above features are might not be enough, Coming Soon Booster offers a broad range of Social Media Icons for making the sharing easier for you. Lets create Coming Soon Page with Zero Efforts & get Maximum Results.